South Station, at Summer Street and Atlantic Avenue (map) is the more important of Boston's two train stations. 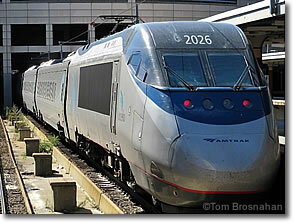 It serves Amtrak intercity trains to Massachusetts, Rhode Island, Connecticut, New York and beyond. Other Commuter Rail lines, and Amtrak's Downeaster train to coastal New Hampshire and Portland, Maine, are served by the smaller North Station, slightly over one mile (1.8 km) to the north of South Station beneath the sports arena variously known as TD Garden/ Boston Garden/ Fleet Center (map). Amtrak Acela locomotive at South Station.